How do I add a Stock? How do I delete a Stock? How do I Add Preferred Stocks? What is the Format for Stock Symbols? How do I add Another Portfolio? What is Current Yield versus Yield on Investment? When Do I Renew My Subscription? How do I Share a Portfolio Across Devices? How do I view my portfolio on the web? How do I Restore My Data ? What is the Purpose of the Override Switch? Why do you charge for a data subscription? How many stocks without a subscription? What if I see a mistake in the data? What stocks do you cover? What currency is being shown in the data? What does the exclamation mark mean? How is UnRealized Gain Calculated? Differences between iPhone and Android app. 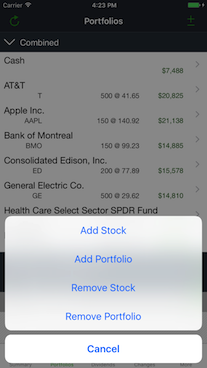 Go to the Portfolios tab and tap the in the top right hand corner and then select 'Add Stock' from the slide up menu. Enter the ticker symbol and then select whether the stock is listed in the US or Canada, and the number of shares that you want. If you have multiple portfolios you can also select which portfolio the stock will be added to, with the default being the currently expanded portfolio. When you are entering the number of shares the app will retrieve the stock details and display the name and last close price. To remove a stock from your portfolio just sell all of your holdings of it. From the Portfolios tab tap on the stock that you want to delete to show the stock details, then tap on Buy Sell at the top right. In the Buy Sell dialog tap Sell and All then Done. Once you have sold all of your holdings the stock will be removed from your portfolio. Use the custom ticker feature to simulate bonds or other financial instruments that are unsupported. 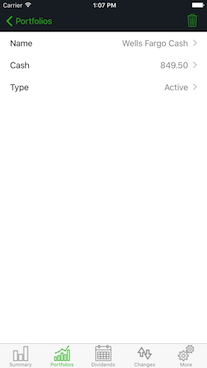 Tap the in the top right-hand corner and then select 'Add Stock' from the slide up menu. In the ticker symbol field enter "unknown". Beneath the input field, the title "Custom Instrument' appears. Now you can enter the number of shares, the commission rate (if applicable) and click Done. How do I add Preferred Shares? Preferred shares don't have a standard naming convention. For a good overview of preferred shares naming conventions please see: Preferred Share Naming Conventions . 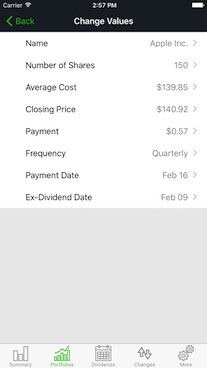 Dividend Predictor doesn't have all of the payment data for all preferred shares at this time, however the app should be able to add them, where you will be able use the overrides to set the payment amount and dates. We are following the naming convention used in Google finance, so for example the symbol for BMO Preferred Class B Series 5 is 'BMO-H'. What is the Stock Symbol Format? Specify the symbol and the country. DividendPredictor will determine which exchange the instrument is traded on. Go to the Portfolios tab and tap the in the top right hand corner and then select 'Add Portfolio' from the slide up menu. 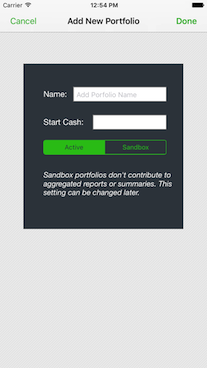 Choose whether the portfolio is 'Active' or 'Sandbox'. 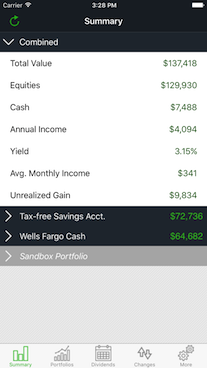 Active portfolios have their positions included in the combined holdings summary, whereas sandbox portfolios exclude them. From the Portfolios tab, tap the 'info' button ('i' inside a circle) beside the portfolio that you want to delete to show the Portfolio Details page. Tap the garbage can icon at the top-right to delete the portfolio. Note that all stocks in the portfolio will also be deleted! Current Yield is the yield based on the latest price of the stock, whereas Yield on Investment is the yield based on your purchase price. When Do I Renew My Data Subscription? You can safely renew your subscription after it expires. Your data wont be deleted, though its display will be limited to 3 stocks in 2 portfolios until you renew. Once you have renewed all of your stocks in all of your portfolios will we displayed again. How Do I Renew My Data Subscription? 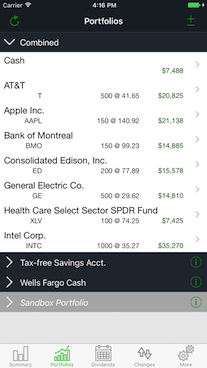 Dividend Feed Subscriptions are purchased within the app. When you first install the app you will receive a free unlimited one month subscription. Once a subscription has expired you will see a red exclamation mark on the More tab at the bottom right of the app, and also on the first item on that page. When your subscription expires your portfolio will temporarily be limited to 3 stocks in each of 2 portfolios until you renew. Once you renew your subscription your full portfolio will be visible again. Don't worry, we don't delete your data! 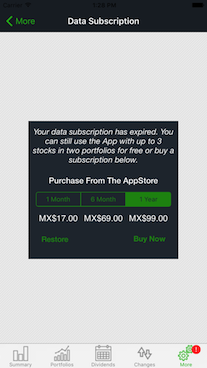 Tap More ➝ Renew Data Subscription to show the Purchase Dialog. Creating an account with MoneyPeeps allows you to share your portfolios across multiple devices, view them on our secure website, and restore your portfolios should you need to. You can create an account from within the app on your device (the one from which you bought a subscription) by tapping More ➝ Account ➝ Create New Account. Enter a valid email address and then choose a password. Once registered, a confirmation will be emailed to you. How Do I Share My Portfolios Across Devices? 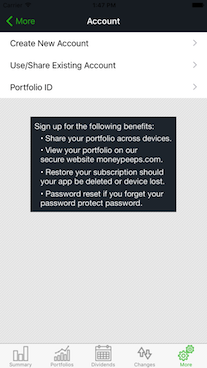 To share your portfolios across multiple devices, you first must create an account with Moneypeeps. Then on the second device install a new copy of Dividend Predictor, and then select More ➝ Account ➝ Use/Share Existing Account. Enter the email address and password you used when you created your account and tap Done at the top-right and you will be connected with your existing portfolios. How Do I Restore My Portfolios? 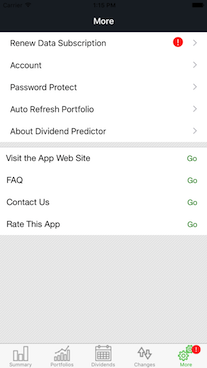 If you have created an account with MoneyPeeps, you can restore your portfolios by entering your MoneyPeeps email address and password within the Dividend Predictor app by tapping on More ➝ Account ➝ Use/Share Existing Account. What's the purpose of the overrides? appears next to the stock details that have been edited. Overrides you entered are saved with your portfolio on the server. 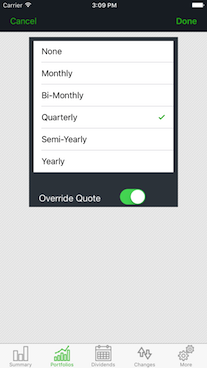 To set an override tap on Change Values just below the stock details and before the Recent Dividends section. Our dividend data feed is not free so a subscription is the fairest payment model to reflect that cost. If there was no charge for the data we would happily use a flat fee for the App. 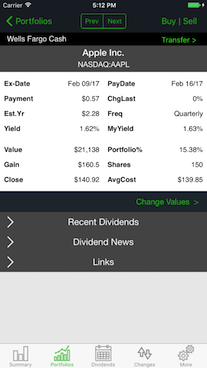 Without buying a subscription, Dividend predictor allows you follow two portfolios with three stocks in each one. No. Closing prices are updated a half hour after market close. If you see a mistake, you can use the override switch to input the correct data. At the same time, please inform us of the error and we will update our database. 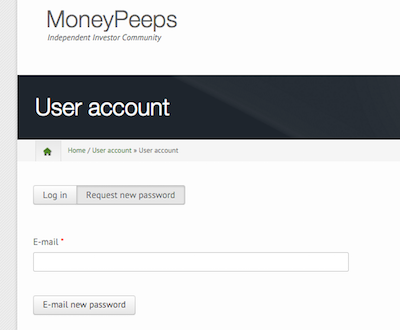 You can let us know in the forum or you can email us directly at: support@moneypeeps.com . While our data set is comprehensive, some stocks may be not be covered within the database. (See below for information on coverage) In the event, that our your ticker symbol was not found in our database, Dividend Predictor returns an update message and also shows an asterisk icon next to the stock. To manually update the dividend information, use the override switch. An asterisk will also appear next to an item which has its override set. An asterisk is also used to indicate items in the dividend report that have been extrapolated from known values. The stocks covered by Dividend Predictor and the MoneyPeeps database are primarily US traded equities that are traded on NYSE, NYSEMKT, NASDAQ, ARCA exchanges, Canadian stocks on TSX, plus many ETF's, closed end funds and larger cap mutual funds. Specifically, we offer about 4,500 traded stocks plus about 700 Canadian traded stocks, which represents the universe of companies covered by professional sell-side analysts on Wall Street. If there is a stock that we are not covering that you would like to see added please contact us at our support email. What currency is reflected in the data? If a stock is listed in the US, then its price will be in USD. 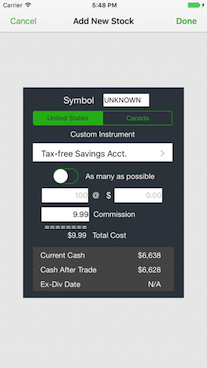 If a stock is listed on the Canadian exchange, its price is shown in CAD. However, if the stock is cross-listed, i.e. is on both the US and CAD exchanges, then the dividend is shown in the currency of the company's respective country. For example, BMO is listed on both the TSX and the NYSE, its dividend is shown in CAD on both exchanges. The stock price however is listed in USD on the NYSE and in CAD on the TSX. next to some of the stock details, it means that Dividend Predictor did not find those details. You can use the override switch and enter your information for that particular stock. The Annual Dividend is the estimated dividends over the upcoming year based on the most recently paid or announced dividend (as opposed to the Trailing Amount). For example if the most recently announced dividend payment for a stock is $0.25 and the dividend is paid quarterly then the Annual Dividend will be estimated at $1.00. 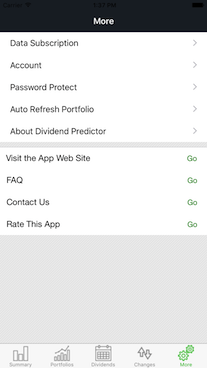 From the day you purchased a subscription for Dividend Predictor, your portfolio's unrealized gain (or loss) will be shown on the combined holdings tab of the summary page within the app. At present the figure is cumulative, and it cannot be graphed, but we hope to expand this feature in a later release, so that you will be able to track gains and losses over time. If you have registered your account with us or shared your account across multiple devices you will have supplied an email address and password that also allows you to access your portfolios on our website. 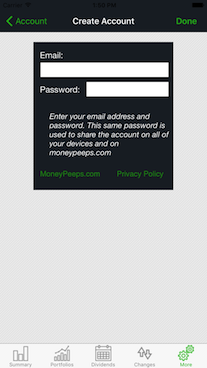 If you need to reset your password you can use this link, https://moneypeeps.com/user/password, and you should see the following screen. Enter your new password in the 'Password' field, and again to confirm in the 'Confirm password' field, then scroll to the bottom of the page and click 'Save' and your new password should be set. The Android and iPhone apps are so different. How come? The iPhone and Android apps are related, but different. The Android version is app-based, whereas, the iPhone App is cloud-based so portfolios can be shared across devices and viewed on the web. 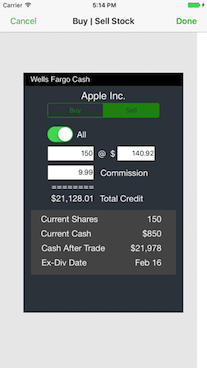 The iPhone app also has multiple portfolios, auto-update, unrealized gain, stock detail overrides, custom instruments, cash balances and many other features.